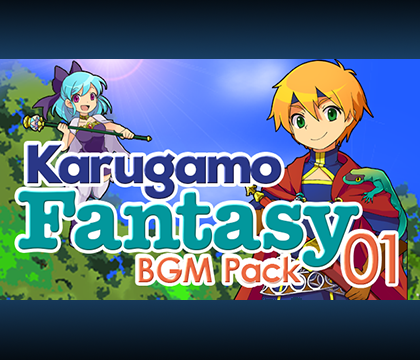 Karugamo Fantasy BGM Pack 01| RPG Maker | Create Your Own Game! Karugamo Fantasy BGM 01 explores some of the staples of video game music- dungeons, towers and travel via land or sea. Whether you're on the lookout for the perfect theme for your epic saga or simply in need of creative music to listen to while you map, you can't go wrong with Karugamo Fantasy! 22 BGM themes, in M4A and OGG formats. .m4a and .ogg formats included. BONUS: Walking character sprite based on the cover art (in MV RTP-style)!